This blog entry is a little delayed after a crazy week of the Community Leadership Summit, then OSCON, then a weekend away for some much needed decompressing. Last weekend the very first Community Leadership Summit happened in San Jose and what a weekend it turned out to be. The idea for the event was inspired by what I felt was a bit of a lack of independent best practise flowing between community leaders. 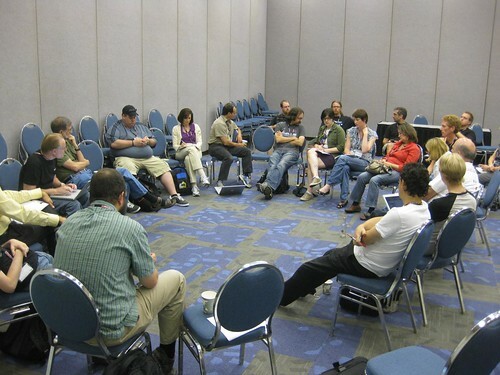 Like many others I would travel to different conferences and shows, and much of the discussion around building awesome community was very much vendor-driven. We would all be talking about our specific communities and the specific achievements we had made. While this is fine and entirely understandable, what was lacking was an environment in which community leaders could share best practise and stories. Stories are vessels of best practise: they are little wrapped up nuggets of information that can flow easily between people. They typically encase not only a meaning or lesson to be learned, but an experience that justifies and emphasizes the learning. We all naturally share stories and we all naturally learn from them, and I was keen to build an environment in which we could share these stories, share ideas and opinions on building great community and meet and greet new friends. This was the core of what I was hoping to achieve with the Community Leadership Summit. The schedule for one of the days. 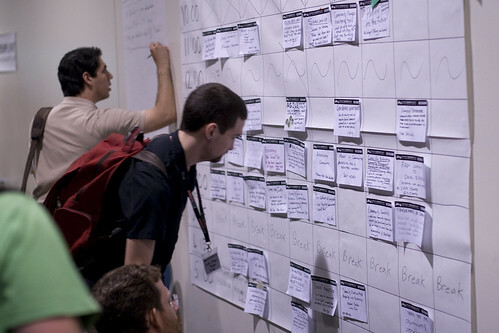 To do this I put together the website and planned for an unconference: an event in which the attendees define the schedule at the event itself. I spent some time getting the nuts and bolts for the event in place such as a collaborative place to share session ideas and information (the wiki), communications channels (the mailing list and IRC channel), and organizing the event itself such as resources, timetables, printing, the schedule area, session cards, projection, audio and other elements. 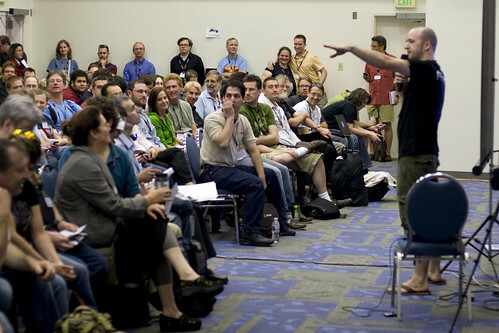 O’Reilly – provided the conference space and lanyards. Alfresco and SourceForge – provided coffee. Canonical and Monty Program AB – provided equipment. Ragga-Wear.com – provided the rather spanky-gorgeous t-shirts. With the logistics of the event pretty much ready to roll I was keen to see how many people would join us. My hope was for around 40 – 60: I felt this would give us a good group for discussion. If we managed to get 100 this would be even better. At 7am on the Saturday morning I showed up with my wife and our excellent team of volunteers (Grant Bowman, Karsten Wade, Mel Chua, Amber and Pete Graner, Kaliya Hamlin and some others who I am sure I have missed off) arrived and we got everything ready. Over the next few hours over 200 people arrived with the final count at around 230. I was astonished. I kicked off the Saturday with a plenary that explained the ethos of the event and then the schedule was open to the audience to run their sessions. What followed was a stunning two days in which a remarkably smart and diverse group of people shared their experience, their stories and their insight for building great community. We had a delightfully wide ranging spread of content across the sessions and most of the ten tracks were filled with sessions for both days. Although the net access was down for the first morning of the event, we did have pretty solid net access throughout the rest of the event (thanks O’Reilly!) and many of the attendees took notes for their sessions here on the wiki. I am planning to gather these notes together into some proceedings for the event. What was so noticeable about the CLS was not only the diversity of the attendees, with people from Open Source, green technology, media, urban regeneration, education, charities and more, but also the passion of these attendees to engage and share with others at the event. Our attendees were not only sharing ideas and insight, but also chomping at the bit to meet and help others to get the most out of the event. There was just a good people vibe hovering over the event for the entire weekend and I was absolutely delighted to feel that: this was exactly what I was hoping for, and it was our incredible attendees who made that happen. One of the many discussion sessions. You can also see a summary of the tweets from the CLS here – skip on a few pages to see the tweets from the event itself. So all in all, I am really happy with the event and I want to thank all of the fantastic folks who made it what it was, both attendees and those helping to run it. I have already started making some initial plans for next year’s event. I am looking forward to what I hope to be one of the most interesting and important annual fixtures for community builders, leaders and managers. Thanks to Jim Grisanzio for the photos. Could you help put something like this together during (or next to) next year’s Debian conference? I think that would be very useful for our communities and our community leaders or people who wish to take on a greater leadership role in a free software community. I think this could be a one day thing just before (or after) the usual Debian Day and also be open to both Debconf attendees and the public.